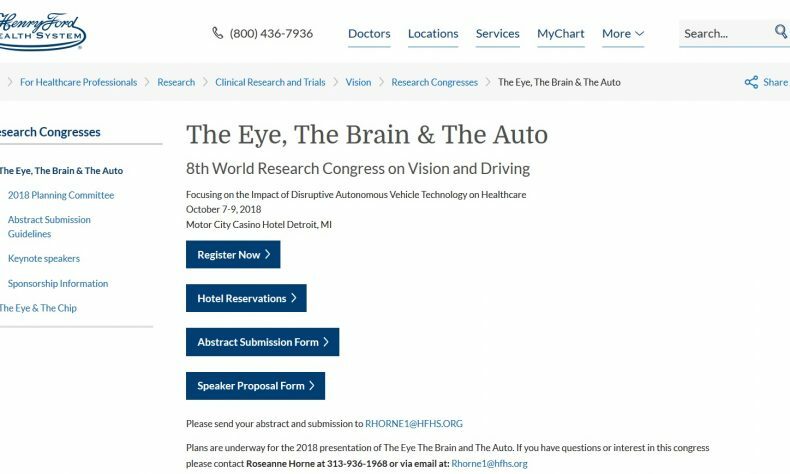 DETROIT — “The Eye, the Brain, and the Auto,” the eighth world research conference on vision and driving, will be held Oct. 7-9 at Motor City Casino in Detroit. Organizers at Henry Ford Health System say the conference will focus on the impact of disruptive autonomous vehicle technology on health care. Confirmed keynote speakers at the event include Menul Bhatt, of the Centre for Applied Autonomous Sensor Systems at Orebro University, Sweden; Larry Burns, former vice president of research at General Motors, now a consultant to the Google autonomous vehicle project; David Cole, chairman of AutoHarvest and Building America’s Tomorrow, chairman emeritus of the Center for Automotive Research; and Gary Shapiro, president and CEO of the Consumer Technology Association. Organizers are also soliciting experts in the field for speaker proposals and abstract submissions. For more information visit www.henryford.com/theeyeandtheauto, where registration and sponsorship information is also available.